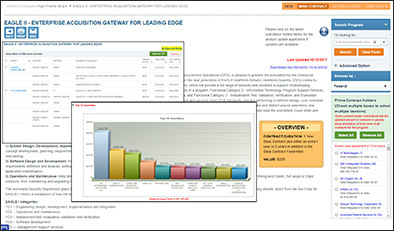 Access a database of activity and overviews from over 1,800 different Programs/IDIQs. The schedules are broken down to SIN levels of awardees and the ability to review their action activity. Your’ll find in-depth summary pages for every IDIQ / Program that has more than 10 anticipated awardees and a value of $20M or more, each created by our in-house analyst team. These talented individuals create a repository for unique IDIQs for members to view the other awardees, scope of the contract, solicitation data and supporting documents as well as action-level activity. Members with Platinum access can find, track and isolate specific task orders by NAICS, agency, title, amount and/or planned task order end date. After finding task order matches, members can analyze the different action-activity for each task order that is listed in date stamp order and manage this specific task order by placement into their File Cabinet. In addition, they can elevate that opportunity into their pipeline and/or proposal management system – the EZGovOpps Collaboration Center. The Task Order tab in Platinum can isolate all activity and sum the obligated dollars for specific task orders. This application is applied to all GSA Schedules, GWACs as well as all high-profile IDIQs. If an IDIQ opportunity is not already present in the GWACs/Schedules and Programs/IDIQs tab, members can freely request the creation of a new program entry that doesn’t fit the “high-profile” criteria. 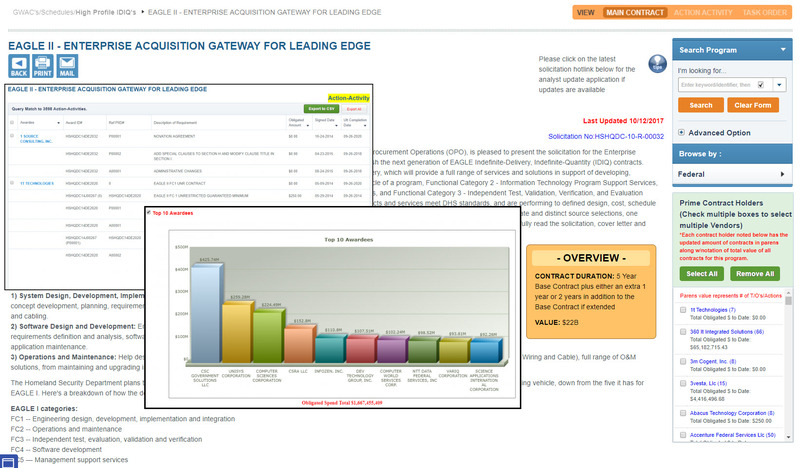 Example of an action-level view for EAGLE II IDIQ including summary page, exportable action-activity overview and the top ten awardees.